news of Local Organizing Committee (LOC) expressing their helplessness in continuing the event arrangements [Read FOSS4G 2012 Cancel Request]. The main reasons given are lack of financial resources and the unexpected withdrawal of the Professional Conference Organizer. If one looks at the sponsors of past FOSS4G events and this year's event the reason for finance crunch can be easily understood. Right from the start of FOSS4G in 2007 Google used to be at the forefront in sponsoring the event. This is the first time Google is not present! This probably is linked to Google's exit from China. Jeff McKenna asserted the same. Esri's absence came as a surprise to me. China may be currently a smaller market for them but capturing new markets would be of interest to any organization. I also could not understand why all the Geo software giants concentrated in the west did not see any business potential in coming to the east to sponsor such a mega yearly event. What puzzles me further is why LOC did not offer discounts and better visibility options for mega sponsors. 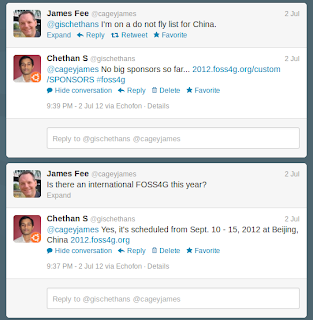 This failure on the part of LOC might go a long way as other FOSS event organizing bodies will think twice before finalizing on China. In addition to this, maybe in the coming years, OSGeo Board will have to look at financial capabilities of Local Organizing Committees before finalizing a venue. Once OSGeo Board approves this, the official announcement will be put up on the FOSS4G 2012 website. 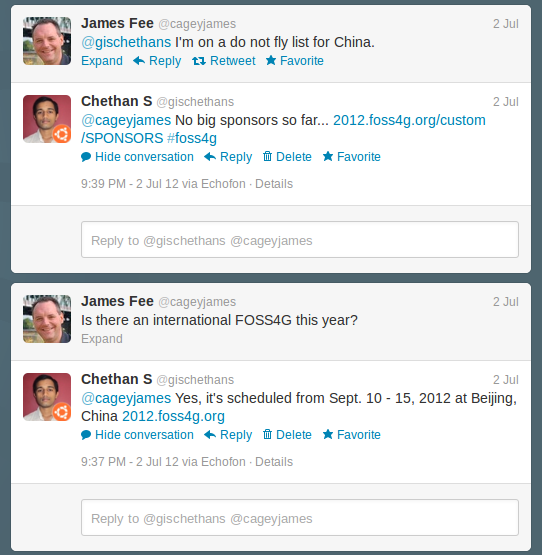 As a FOSS4G fan I honestly wish that the conference would not be canceled and go as planned.